I am not sure how much time I will have to write while I am in New Zealand, but I hope to post at least a few updates. So far, the only word I have for this country is AMAZING! Getting here is long, difficult, and expensive, but it is so worth it. I am just in awe. If you want to truly experience the grandeur of God’s creation, this is one of the places you must visit. I flew from Thailand to Kuala Lumpur to Auckland. My lovely and far-too-patient wife, Kathleen, was there waiting for me. This is how we are celebrating 25 years of marriage. Well…I am celebrating. I suspect Kathleen is mourning. 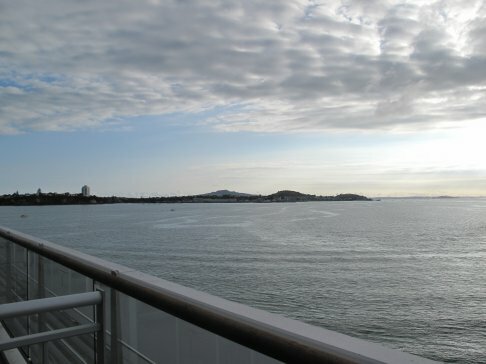 In any event, we stayed at the Auckland Hilton, which had an amazing view. 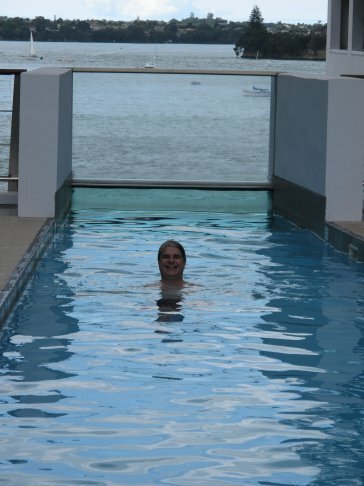 In fact, one end of the swimming pool was glass so that you could enjoy the view even when you were in the water. Auckland was great, but it was like many port cities in the world. 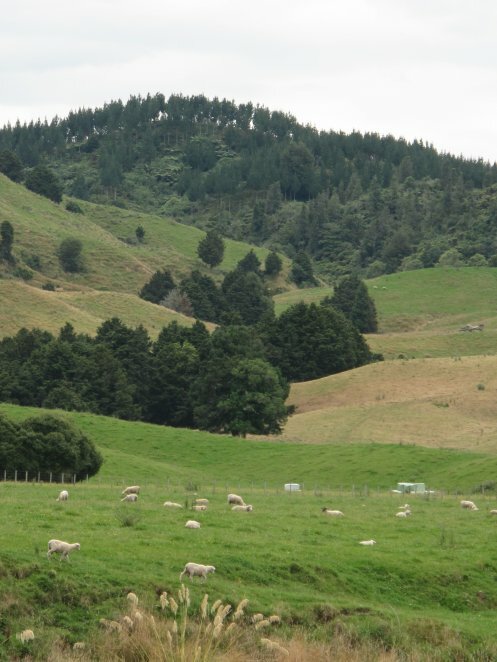 We drove from Auckland to Waitomo, and as we drove, this is the kind of scenery we saw. These little guys are the larva stage of a fungus gnat (genus Arachnocampa) that is native to New Zealand. When this gnat hatches, it spins a “nest” of silk and then dangles threads down from the silk. The threads are coated with mucus, and they are designed to trap insects so the glow worm can eat them. Glow worms live in caves because wind would cause their threads to get all tangled up. Thus, they need a place with no wind. So the adult lays eggs in a cave, typically one that has a river flowing through it. 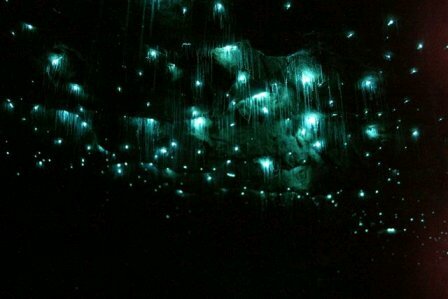 The glow worms glow in order to attract insects that have come into the cave on the river. After 6-12 months of eating insects, the larvae become pupae, and in about 1 or 2 weeks, they become adult gnats. The adults live only long enough to mate and lay eggs. In the tour, we actually floated down the river that runs through the cave. We had to be very quiet so as not to disturb any adults that might be in the process of laying eggs. As we floated down the river and looked up at the glowing patches on the ceiling, it seemed to me that I was looking at stars in the night sky. Kathleen said it reminded her of the stained glass on the ceiling of a cathedral. Needless to say, I did not regret my choice to see this instead of the Super Bowl. In fact, given the Colts disappointing performance, I am glad that I didn’t watch it. 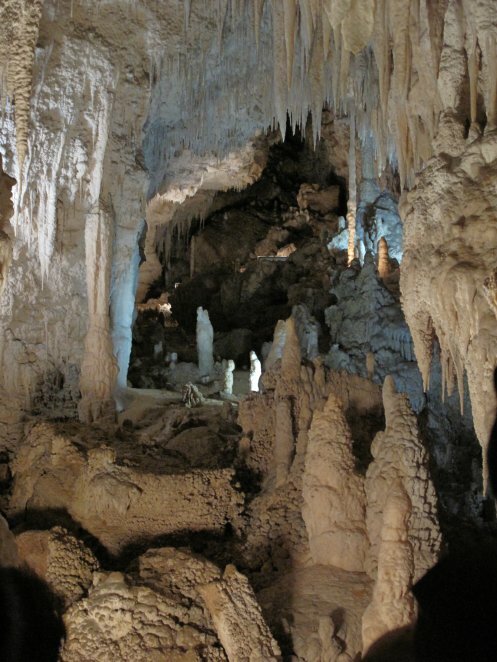 While we were in Waitomo, we saw another really nice cave. It didn’t have glow worms, because it doesn’t currently have a river running through it. It did have some wonderful calcium carbonate formations, however. Once we left the caves, we headed to Lake Tarawera, which is a gorgeous lake in the “Bay of Plenty” area in New Zealand. We stayed in a lovely lodge that is run by an incredibly friendly lady named Kay. We had a great time there, and then we went to Te Puia, the Maori arts and crafts center in that area. 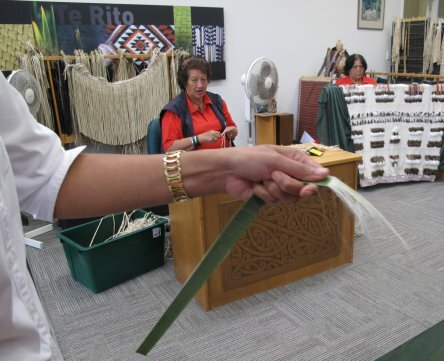 When Kathleen and I were in New Zealand working with homeschoolers, we had a chance to experience some of the native Maori culture, and we loved it. So we definitely wanted to experience some more in this vacation. I think the shells used in the eyes here just make the entire piece come to life! 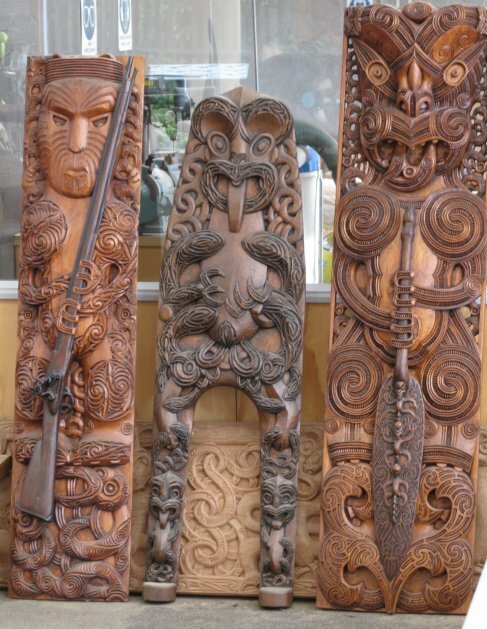 In Te Puia, they are making sure this art form stays alive by training young people to do it. The work that they do is astounding. For example, the carving on the left in the picture below depicts a man holding a rifle. Note that this rifle was not added to the carving. It was carved right out of the wood, like everything else. The Detail Work is Incredible! We also spent some time learning about their weaving. Because land mammals are not indigenous to New Zealand, the natives could not wear animal skins as clothing. Thus, they had to weave their clothing from plants. Mostly, they used flax. As this picture shows, if you pull the tissue from the plant in the right way, fibers can be found, and those fibers can be used for weaving. 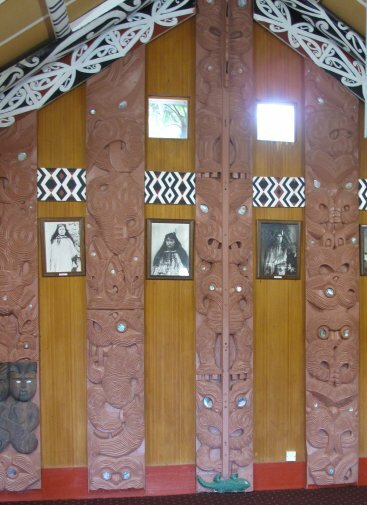 We also toured some Maori buildings, which I loved because they featured the woodworks of the culture. Interestingly enough, you are not supposed to wear shoes in a Maori home, and you are not supposed to eat in a Maori home. There is a separate building in which you actually eat. The little green guy in the second column from the right is a tuatara. This interesting reptile is found only in New Zealand, and before it was discovered there by scientists, it was thought to be extinct, because its fossils are only found with the fossils of dinosaurs. This, of course, indicates that interpreting the fossil record as a record of time leads to erroneous conclusions. It is more reasonable to interpret the fossil record as resulting from a worldwide flood. One other thing we saw at Te Puia was some great geothermal activity. New Zealand is full of hydrogeological hotspots, and Te Puia had a great one. 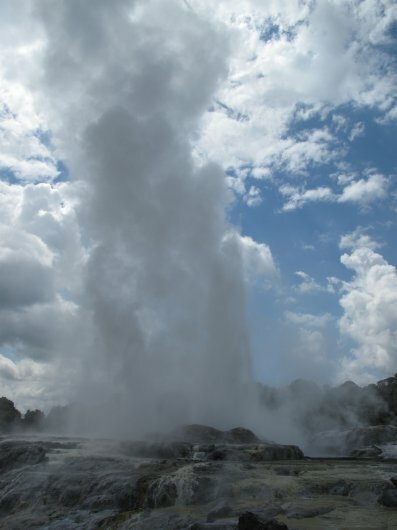 The geyser below erupts about 30 times a day there. Unlike “Old Faithful” in Yellowstone, however, the timing is not predictable. Thus, we had to wait about 20 minutes, but it was well worth the wait. 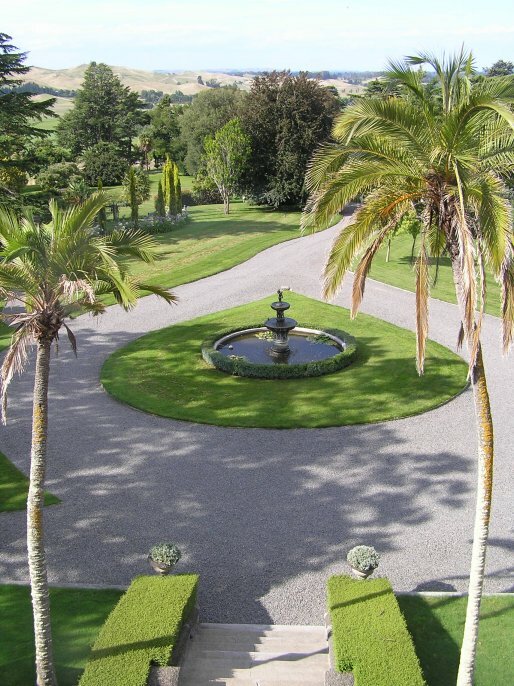 We are now in Hastings, which is in the heart of some of New Zealand’s best wine country. Needless to say, I will be sampling a lot of the local “fruit of the vine” while I am here! Hopefully I will have a chance to write some more once we have explored this little part of paradise.